I'm sure you'll be shocked to learn that that's not what Gallup's survey actually says. 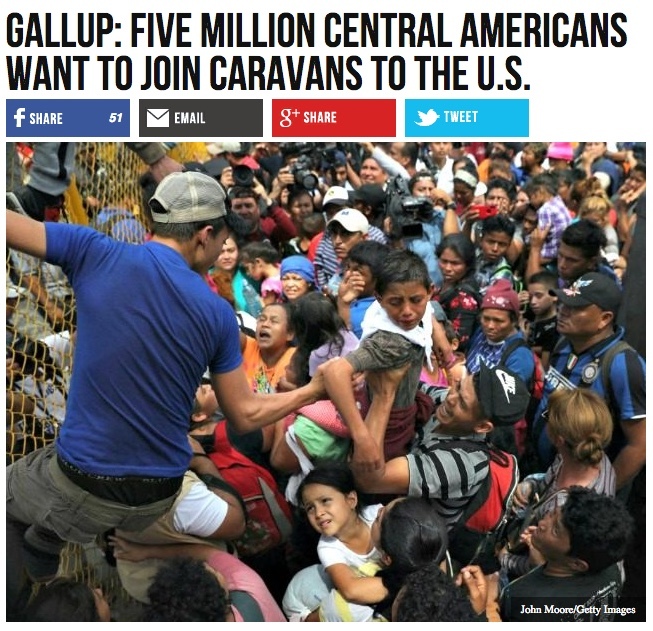 Five million poor Central Americans want to migrate into the United States’ communities and workplaces, according to a report by Gallup. Notice that the linked item from Gallup doesn't say that the people surveyed want to come here in a migrant caravan. Or want to come here illegally in any other way. And only a small percentage seem to be really serious about moving. That's 2% who intend to move to any other country. And we have no idea how many of those 2% will actually follow through, or how they intend to attain residency. However, these Gallup numbers may be far too low. People stuck in their poor homelands may not want to admit their frustrated wish to migrate. Also, rising migration spurs runaway migration once successful migrants use their cell phones to video and broadcast their glamorous success in Europe and the United States to their homeland peers in their towns, villages, and families. Don't let them in! Those people breed like rabbits! But ... but ... but I thought the immigrants were all parasites bleeding us dry! This says that "investment and wealth" gravitate to states where the immigrants are hired! I'm confused! In any case, they're coming, they're bad, and they'll be under all your beds soon.